The secret, in other words, is out. Vinyl ain’t going nowhere. It’s here to stay. As a result, not just LP manufacturers, but audio companies are going into overdrive to produce goods to satisfy a small albeit growing market. One such company is Pass Labs. Its eponymous name derives from fabled designer Nelson Pass, and it’s now producing a phonostage called the XP-25. Does the latter sound good? No. It sounds stellar. For $10,000, it should sound excellent. But the XP-25 represents a sonic breakthrough at that price level. Its combination of refinement and vanishingly low noise floor make it a winner. When International Record Store Day came and went in April, it attracted a good deal of attention in the mainstream media. The New York Times, for example, devoted a piece to the resurgence of turntables. It was even written in a respectful fashion rather than suggesting a bunch of weirdoes is clinging to an obsolete contraption from the past (though, even if people were, it wouldn’t necessarily be cause for shame). To test the XP-25, I ran it extensively with my Continuum Caliburn turntable, which I’ve owned for almost five years, and my new reference cartridge, the Lyra Atlas, which claims an amazing ability to separate instrumental lines and possesses superb dynamics. It served as a great platform to assess the XP-25’s performance. Pass has recently issued a number of new products, including a megawatt $85,000 amplifier called Xs-300 that looks as though it has arc-welding capabilities. The XP-25, by contrast, is not in that price category. Nor does it appear particularly prepossessing. It comes in two fairly utilitarian-looking boxes. 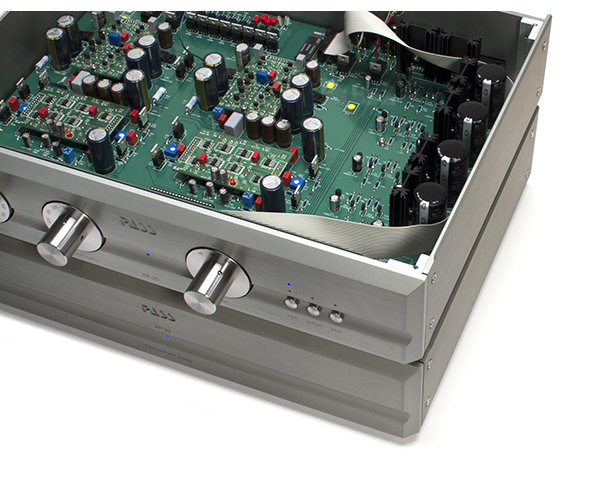 The first houses a sophisticated power supply; the second, the phonostage itself. The units are connected via a single computer cable, thin and extremely flexible. The XP-25 is a fully balanced design with both balanced and unbalanced outputs. If you own two turntables, then you’re all set with the XP-25, which boasts two single-ended inputs. 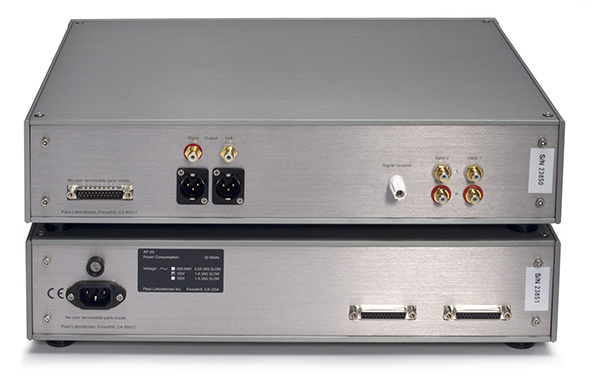 The XP-25 features three levels of gain: 53, 66, and 76dB. I opted for 66, which should prove more than ample for most systems, unless you’re trying to blow your preamplifier to kingdom come. It also has a mute switch, a rumble filter, and separate knobs adjustments for capacitive loading of cartridges. 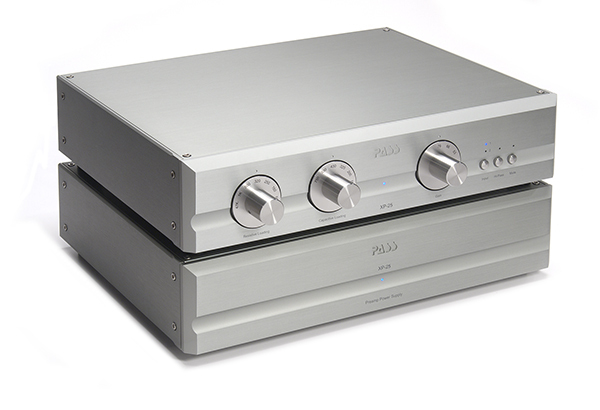 All in all, a no-nonsense unit with just enough functionality to please most audiophiles. If silence is golden, the XP-25 has definite bullion-like qualities. For one thing, it doesn’t produce hiss or buzz. The black backgrounds are sensational. The lack of grit or noise allows the ear to relax on what amounts to a sonic pillow. There’s no hunching of the shoulders waiting for an aggressive treble transient to hit here, the kind that makes you wonder whether if it wouldn’t be saner just to listen to the car radio rather than trying to dial in a high-end system. Indeed, the XP-25 creates a blissful experience. Yup, it has plenty of pop and slam. But that’s not really what the unit is about. Rather, it’s about tranquility and nuance. Instruments just seem more present, to pop out in space more vividly when the backdrop is jet-black, as it is with the XP-25. The Pass is clearly a champion in the no-noise department. Via a Persuasions LP, I am particularly struck by the sense of space between the singers—it’s possible to hear feet shuffling and other tiny auditory cues that enhance the sense of sonic realism. Sure, it’s a little hi-fi when you play gospel records in such a manner, but it sure can impress the heck out of your friends and neighbors, and it’s good to have some fun with the system. This hobby is most emphatically not supposed to be about a bunch of audiophiles pretending to be white-coated lab technicians sitting in front of their stereos. Let it be, as the Beatles said. Does the lack of noise also add a degree of finesse? To an extent. I listened very closely at a fairly low-volume setting to an Arkiv LP of Vivaldi’s Lute Concertos and Trios. The XP-25’s silence allows a particularly fine rendering in the slow movements, and where the tinkling of the harpsichord behind the lute and violin is barely audible, each note is clearly and finely rendered. So the Pass is very good at low-level detail retrieval. Does the lack of tubes mean that its sound, as audiophiles are wont to say, is too “solid-state”? No. Intriguingly, the XP-25 sounds more tubey than some tubed units. Consider the recent remaster of Shelby Lynne’s Just a Little Lovin’. On the cut “Anyone Who Had A Heart,” her voice is smoother and more seductive than through some tubed units I have heard. How Pass pulls off this feat is an interesting question. Capacitors or wire or circuit design? I presume Pass would answer “all of the above.” Whatever the technical response, the XP-25 definitely does not fall into the lean or astringent camp. Quite the contrary. The smoothness of the XP-25 comes across most clearly on a wonderful remastering of trumpet great Lee Morgan’s The Procrastinator [Music Matters]. On “Rio,” which has a bossa-nova feel, I’m simply bowled over by the degree of finesse, filigree of detail, sheen of the cymbals. It made me realize once more what a terrible loss Morgan’s early death, at the hands of his aggrieved common law wife, who shot him in February 1972 at the East Village nightclub Slugs, remains. Despite its prowess, the XP-25 faces stiff competition. No, not at $10k. At that price level, it becomes a matter of taste and preference. As stated above, I’m hard-pressed to think of a phonostage that will surpass the XP-25’s performance in its price region. Sure, move up into nosebleed territory and you can get more. For more money. My own Ypsilon phonostage takes up the performance one more notch in terms of dimensionality and sinuous musical lines. But it also costs more than twice as much. For anyone owning a megabuck phonostage, the XP-25 is likely to give pause. Is it really necessary to spend more? Will there be a quantum leap in performance above the Pass? Nope. Given the state of the hobby, the XP-25 represents a good value. It comes near the bleeding edge in performance, but its price—expensive by any reasonable measure—is not stratospheric, at least by current standards. 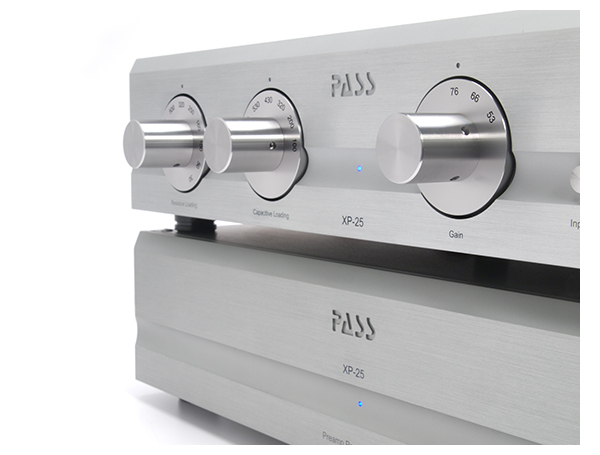 Another plus is that, unlike some more exotic equipment, the Pass exudes reliability. Its build quality seems rock-solid. It’s difficult to imagine anything going wrong with it. The model exudes the appearance of a piece of equipment that does nothing but sit there and play and play. Anyone in the market for a high-end phonostage should consider auditioning the XP-25. You may find yourself most impressed by what it does not do. I am. Pass is certainly popular here at TONEAudio. Contributor Lawrence Devoe also uses the XP-25 in his reference system, and I will be keeping the XP-25 after it returns from Mr. Heilbrunn. I concur with Heilbrunn that there are still a few more molecules of analog performance to be mined, but nothing else wraps ease of use, versatility, and overall high performance into one package like the XP-25. While the XP-25’s performance is commensurate with the sticker price, analog enthusiasts that own turntables with multiple tonearms and/or removable headshells, and who are often prone to switching cartridges, will be in heaven. All the adjustments are right upfront and easy to read, making fine-tuning a snap. Auditioning the XP-25 with about a dozen different cartridges from the meager Shure M97 all the way up to the Lyra Atlas is a treat. Nothing threw this phonostage a curveball it couldn’t hit. Turn it on and forget about it. It reaches full bloom after about three days of being continuously powered up. Those worried about their carbon footprint, rest assured: At .15/kwh, the XP-25 costs about $2.50 per month to leave on. In these days of $100 monthly cable bills, it’s a small price to pay for sonic bliss.